Nubby's pork steak is a 1.5-pound behemoth. 11133 Lindbergh Business Court, 314-200-9123; Mon.-Thurs. 11 a.m.-11 p.m.; Fri. 11 a.m.-midnight; Sat-Sun. 9 a.m.-midnight. Matt Hines was floored when folks started coming from across the river to check out Nubby's. When Rick and Jan Lloyd showed up all the way from California, he was positively gobsmacked. 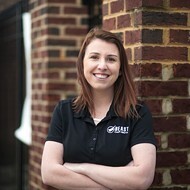 Hines' five-month-old south county barbecue restaurant had become a destination. Hines' surprise at that fact doesn't reflect a failure to recognize the quality of his work. Ever since he started seriously smoking meats in his backyard, about two years ago, Hines knew he was onto something special. He set out to achieve as much, beginning his barbecue project with a vision of capturing the nuances that different woods impart to various types of meat, something he felt was missing in the area's explosive barbecue scene. 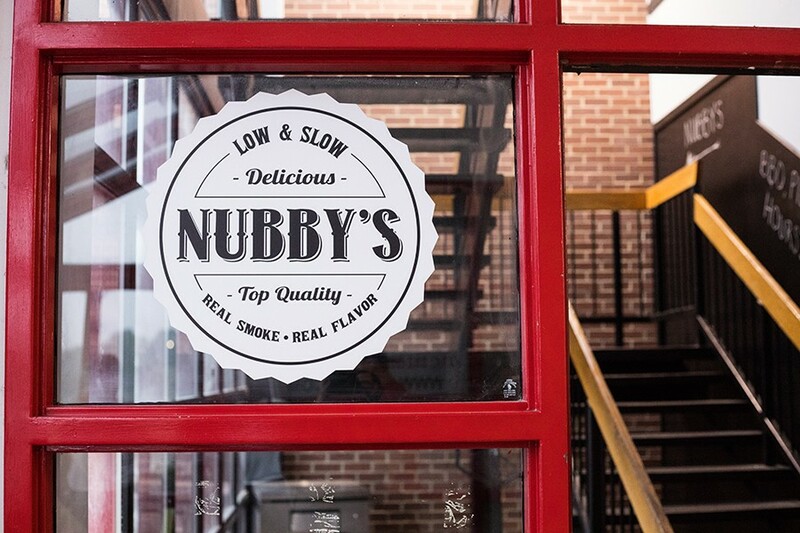 However, unless you are a serious barbecue enthusiast like the Lloyds, a friend of Hines' family or a club hockey player, you'd have no reason to know that Nubby's exists. 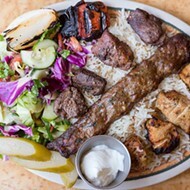 The restaurant sits off a business court in deep south county, on the second floor of All American Sports Mall, a rec complex that hosts roller- and ice-hockey games, baseball clinics and a handful of miscellaneous businesses, such as an audio-visual company and a chiropractic office. 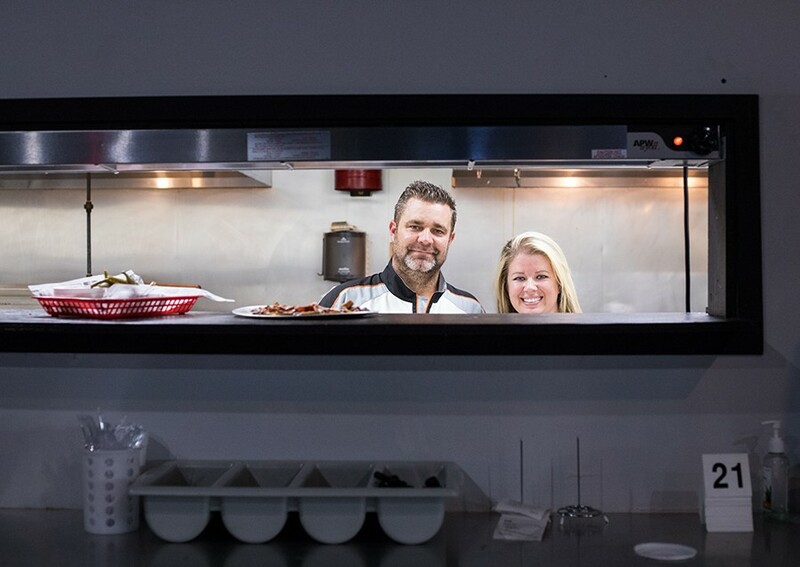 Owner-pitmaster Matt Hines and front-of-house manager Jami Rees. 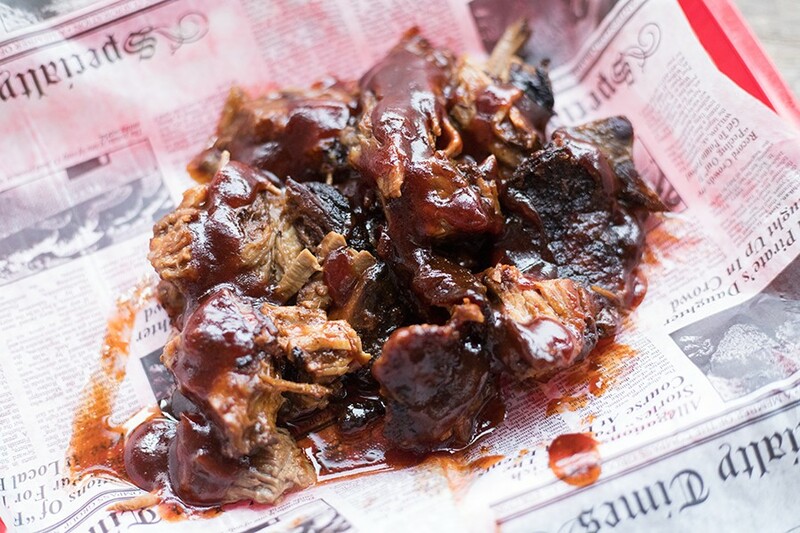 Hines knows Nubby's location is far from the first place you'd expect to find top-tier barbecue — he hears it from just about everyone who makes the trek in and circles Lindbergh Business Court, looking for what they wrongly assume must be a standalone restaurant. 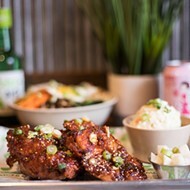 But when a friend who owns the complex saw how serious Hines was getting about barbecue and offered to let him take over the existing restaurant space, which had been sitting vacant for eight years, the offer was simply to good to refuse. Besides, Hines did not have much time to look for something else. Until he opened Nubby's in February, he had been working in the landscaping business, running an operation that created custom patios. Barbecue had been a way to decompress in his free time, but the more he got into it, the more he realized he wanted to devote himself fully to smoking meat. Within two months of his friend suggesting the space, he had converted it from a vacant sports bar into a massive barbecue restaurant. "Massive" is not hyperbole. 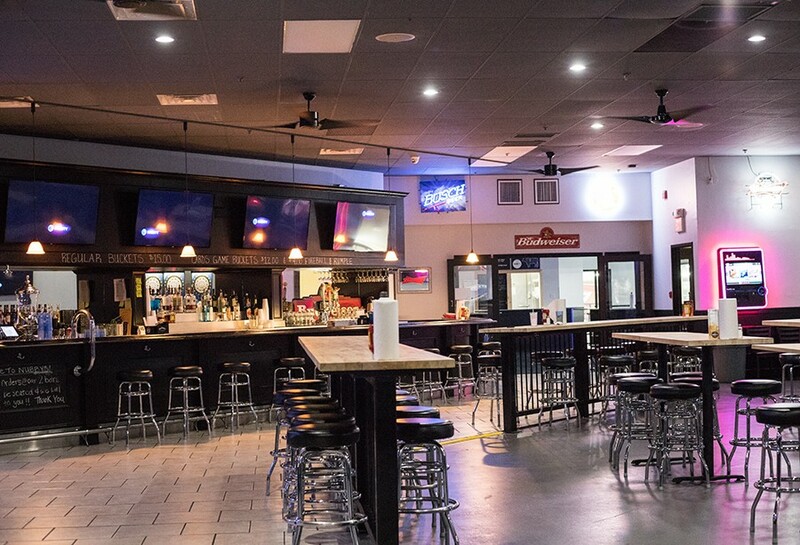 Nubby's occupies the entire second floor of All American Sports Mall and consists of two separate rooms: One, which contains the main order counter and some high-top tables, looks over the hockey rinks; the other is a huge, open sports bar complete with a wall of televisions, darts, skee ball, a seating area with leather couches and a bar that takes up nearly the entire back wall. The setup is mainly counter service, though on one occasion, a friendly bartender greeted our table with menus and took our orders. Nubby's is located inside the All American Sports Mall. It's a cozy setup if you can get there; my only complaint with the restaurant is that it is not accessible. There is no elevator, rendering it basically impossible for people with certain disabilities or mobility issues to get up to the second floor. Hines is not the building owner, so I understand this is out of his hands, but I hope it will be addressed. The neon liquor signs and banners that decorate the room make Nubby's look like the sort of county sports bar where you'd find deep-fried finger foods like crab Rangoon and things akin to a taquito — and you will, only instead of straight-from-the-deep-freeze junk, they are handmade and based on old family recipes. The Rangoon, for instance, is a delicate, hand-rolled wonton wrapper filled not only with hunks of imitation crab but also a black-peppery, scallion-laden cream cheese. Flaky, and not at all greasy, these golden wontons have more in common with a haute beggar's purse than the heavy, mass-produced versions found on a Chinese American buffet. 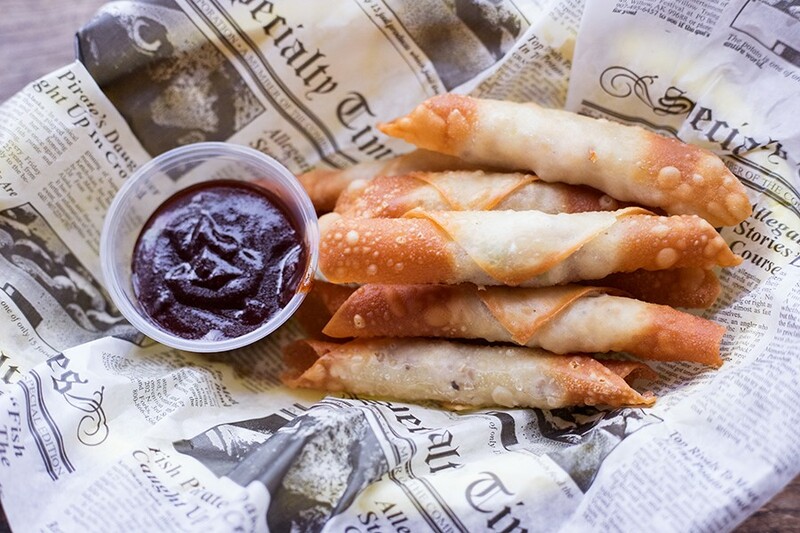 Nubby's beloved "Chorks" feature a mix of smoked chicken, pork and spices in a crispy wonton. Nubby's "Chorks" are another example of a fried bar appetizer done extremely well. The same wontons used for the crab Rangoon are filled with a mix of smoked chicken, pork and a top-secret minced vegetable component that tastes like pickles. The filling is then rolled into a cigar shape that looks like a taquito but is actually a two-bite roll-up of delectable barbecue. Hines both celebrates and curses the "Chorks" success, lamenting how difficult it is to keep up with demand. They may be a pain to make, but they are worth the effort. Burgers also set Nubby's apart from the average sports bar. Hines uses a blend of chuck and brisket for a decadent, thick patty. But what makes the burger so mouth-watering is that he mixes the beef with a touch of his beef marinade prior to cooking. The savory sauce infuses the meat with flavor from the inside out and caramelizes around the exterior when seared on the flattop. It's wonderful just simply dressed with some lettuce and tomato on a grilled bun. As a patty melt, smothered with Swiss cheese, grilled onions and 1000 Island dressing on bacon-fat-grilled marble rye, it's otherworldly. The patty melt is the kissing cousin of one of Nubby's other outstanding sandwiches: the brisket Reuben. Here, Hines shows off his barbecue prowess with thick, fatty, fall-apart slices of the smoked beef, then piles them atop marble rye with Swiss, sauerkraut and 1000 Island. It's as good a riff on the classic Jewish deli staple as I've seen. That brisket, however, needs no adornment to shine, as is apparent when it's presented as a simple barbecue platter. The thick slices are not quite as broken down as Texas-style barbecue, but they are close — and among some of the best served in the area. The same can be said for Hines' pulled pork, which picks up the subtle sweetness of its peach wood smoke. The tender meat is hand-pulled in large hunks – not shredded beyond recognition as is the case at lesser barbecue operations. 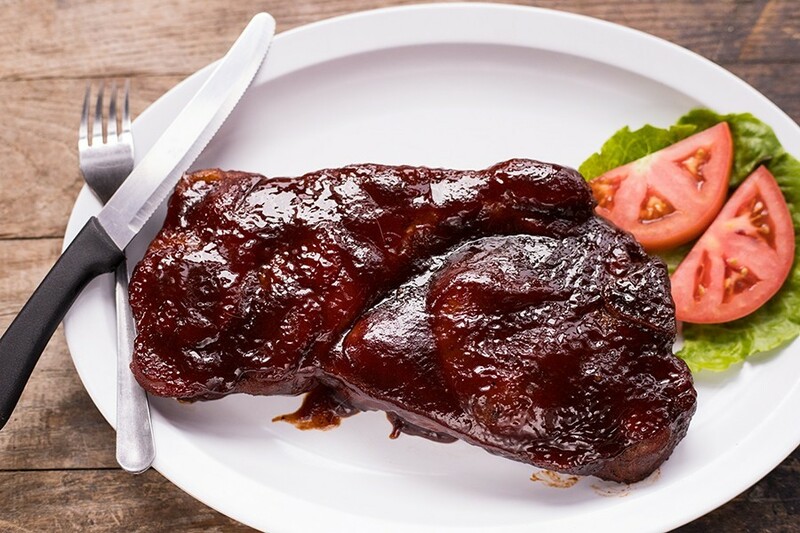 Likewise, it's succulent enough that it does not need to be doused in sauce, though if you choose as much, you'll be treated to a sweet, molasses-y glaze that is the KC barbecue sauce of your dreams. That peach wood also shines through on Nubby's ribs, which are dry-rubbed with a sweet-and-peppery spice blend then smoked enough to be tender but still retain their chew and pull-style texture. Your server will ask if you want them with or without sauce, but you won't get that option on Nubby's pork steak. At one-and-a-half pounds, it's a thick-cut behemoth, coated in a sweet and tangy sauce that makes Maull's seem like tomato water. The smoky meat doesn't quite fall apart, but it's tender enough that you can dig in without a steak knife — that is if you can refrain from picking it up with your bare hands and devouring it caveman style. 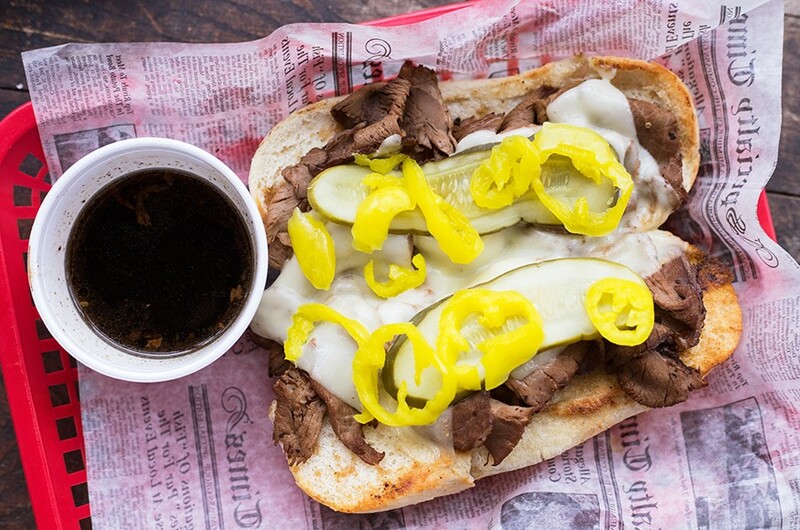 The house-smoked roast beef sandwich is topped with Provel and pickles. Along with that behemoth of a pork steak, Nubby's fatty brisket and deep, smoky ribs have the wow factor when placed in front of you, but the restaurant's best item may be its most understated: the smoked turkey. The sweet flavor of fruit wood stands out without taking over, and the meat is the juiciest smoked bird I've ever enjoyed. Putting sauce on such a beautiful specimen would be blasphemy. It's perfect as is. 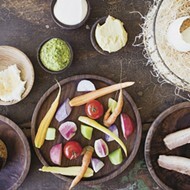 Hines takes pride in his side dishes, which are mostly old family recipes. 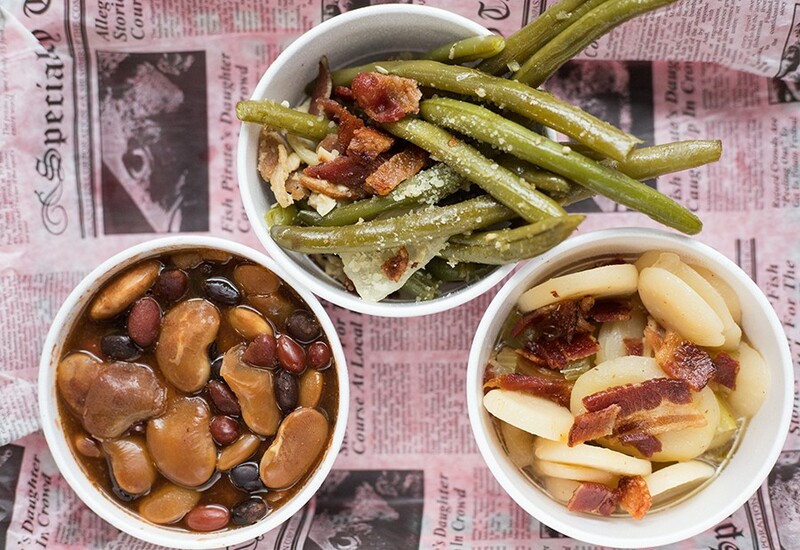 They have that homey family-picnic feel to them: crisp green beans glazed with maple and accented with hunks of bacon, and baked beans, which are a mélange of several different varietals, including large butter beans, lightly tossed in a sweet sauce. Mac and cheese is so rich and creamy it should come with a waiver. Provel and heavy cream form a luxurious sauce that coats the noodles in a velvety blanket. You can't stop eating it, even as you can feel your arteries start to constrict. Side options include maple-bacon green beans, baked beans and a terrific German potato salad. The side I can't stop thinking about, however, is the German potato salad, an old recipe from Hines' grandmother. Unlike most versions of the old-fashioned picnic staple, this one does not hit you over the head with vinegar. It's there, but is tempered with sugar and bacon fat to give it a rich, smoky mouthfeel. On all three of my visits, it's the dish my tablemates most raved about. My family and friends aren't the only ones swooning over it. Remember the Lloyds, those barbecue pilgrims from California? They were so taken with the potato salad that it ended up being the highlight of their trip. They begged Hines for the recipe, and it's now served at all their family functions. A new family staple and some fantastic barbecue might be reason enough cross the country. Lucky us; all we have to do is drive a few miles south on I-55.